DOLPHINS IN TREES — Authentricity, Inc.
Dr. Seuss meets Tony Robbins in this children’s book with implications for all of us. Growth mindset, self-efficacy, empathy, and the power of connection are all highlighted in this sure to be classic. Dizzy the Dolphin meets Mindful the Monkey after an unlikely chain of events. Lives are transformed as a friendship evolves in a masterpiece that will touch your heart in ways that children's books rarely do. Looking for ways to incorporate Dolphins in Trees into your curriculum? Click on this text to read the full article from Alicia Ray of DBC Publishing. Choose a character from the story and rewrite the story from their point-of-view. Pretend you are one of the animals who did not help Mindful. What would you have done differently? Tell about a time that you lost something. Did someone else help you find it? How did that make you feel? Create a storyboard sequencing the events in the story. Use Dolphins in Trees to kick off a week of Random Acts of Kindness. Have a discussion about differences and how those make us unique. Pretend you are a member of Mindful’s monkey family. Write a letter of thanks to Dizzy the Dolphin. Then write a letter to someone who has been helpful to you in real life. Act out the story as a readers’ theatre. The monkey’s name is Mindful; what does it mean to be mindful? Have a discussion sharing ways to maintain mindfulness in school. Dizzy takes a risk by coming out of the water to help Mindful. What risks have you taken and what were the results? Did you fall from the tree, or did you use your echolocation to find what you were looking for? 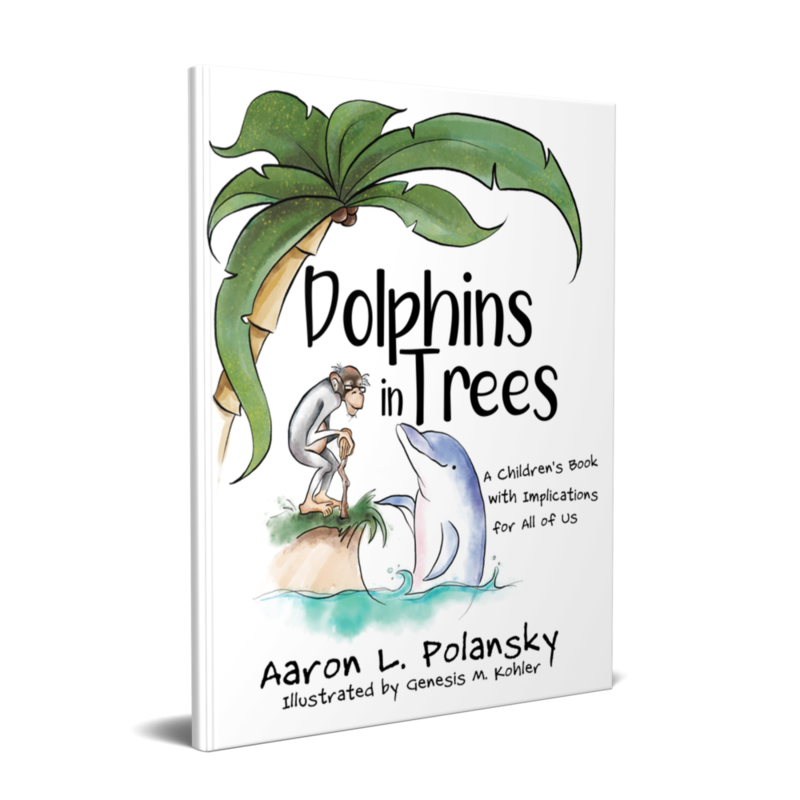 Aaron Polansky’s DOLPHINS IN TREES is a beautiful metaphor for educators. We not only need to be mindful to help others — in turn, we may elevate their thinking. One sentence (“We miss all of the chances that we never take.”) perfectly challenges us to be role models for both our peers and students. Don’t let the guise of children’s literature fool you: DOLPHINS IN TREES has the power to recalibrate your mission as an educator. Aaron’s exudes enthusiasm and compassion for others in his life and it comes through in the pages of his book Dolphins in Trees. With underlying themes of family, helping others, and taking risks, Aaron brings to us a heartfelt story that resonates with all ages. His work, Dolphins in Trees, effectively illustrates the positive impact one person can make on another through selflessness and connection. Similarly, as an educational leader, Aaron puts his students first, learns their stories, and celebrates their successes; but most importantly every day he models the impact of using simple words of “Are you okay?” Three simple words, that can change a course of a life. This clever story is fun, heartwarming and a reminder that there is always something we can do for others. An unlikely encounter leads to the awareness that everyone has value and purpose in life. This book encourages children to want to do even more for others and give everyone a chance. It is true, kindness is contagious.